The Godot community is rich and international. Users come from all around the world. Some of them are young, and many aren't native English speakers. That's why we must all write using a clear and a common language. For the class reference, the goal is to make it easy to read for everyone and precise. A technical writer's job is to pack as much information as possible into the smallest and clearest sentences possible. These guidelines will help you work towards that goal. Use the direct voice when possible. Take the classes, methods, and constants you describe as the subject. It's natural to write using the passive voice, but it's harder to read and produces longer sentences. Do explain what's the consequence of this "set": use precise verbs like place, position, rotate, fade, etc. The progressive forms describe continuous actions. E.g. "is calling", "is moving". Don't use the progressive form for instant changes. Game creation and programming aren't simple, and nothing's easy to someone learning to use the API for the first time. Other words in the list, like just or actual won't add any info to the sentence. Don't use corresponding adverbs either: obviously, simply, basically, easily, actually, clearly. Don't use words like "the former", "the latter", etc. They're not the most common in English, and they require you to check the reference. Avoid "The milk of the cow". It feels unnatural in English. Write "The cow's milk" instead. The 'Oxford comma' is an optional comma before the word 'and' at the end of a list: We sell books, videos, and magazines. [...] Not all writers and publishers use it, but it can clarify the meaning of a sentence when the items in a list are not single words: These items are available in black and white, red and yellow, and blue and green. It's the only description in the "Create New Node" dialog. The brief description should explain the node's role and its functionality, in up to 200 characters. Use the node's full description to provide more information, and a code example, if possible. Notice the exception to the "direct voice" rule: with the move method, an external collider can influence the method and the body that calls move. In this case, you can use the passive voice. For boolean member variables, always use if true and/or if false, to stay explicit. Controls whether or not may be ambiguous and won't work for every member variable. In the class reference, always surround arguments with [code][/code]. In the documentation and in Godot, it will display like this. When you edit XML files in the Godot repository, replace existing arguments written like 'this' or `this` with [code]this[/code]. The developers chose some specific words to refer to areas of the interface. They're used in the sources, in the documentation, and you should always use them instead of synonyms, so the users know what you're talking about. 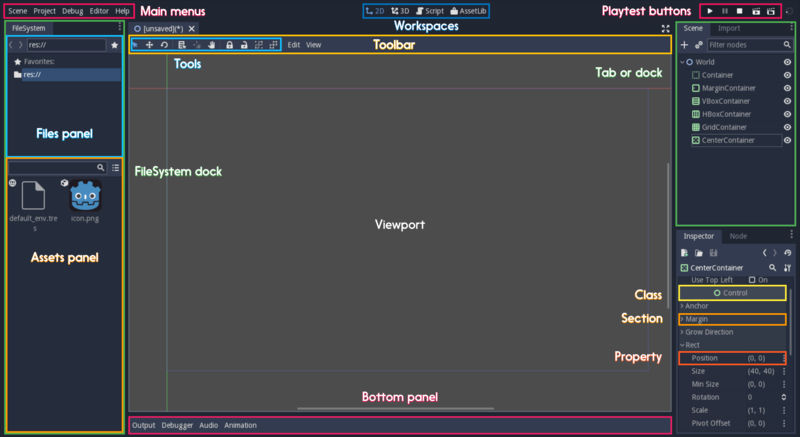 Foldable areas of the Inspector are sections. The node's parent class names, which you can't fold, are Classes e.g. the KinematicBody2D class. And individual lines with key-value pairs are properties. E.g. position or modulate color are both properties.